Turn a usual day in the life of your special one into a winning one by delivering to the one’s door, this Gladness’s Fulfillment Dry Fruit and Toffee Gathering and let the fabric of feelings embracing you two be illuminated all the more. 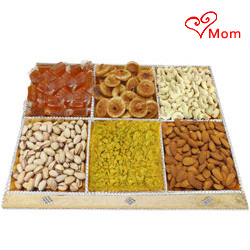 This rejoicing Tray is glutted with 50 gm Almonds, 50 gm Raisins, 50 gm Cashews, 50 gm Pistachios, 50 gm Mango Toffees and 50 gm Figs. Note: Tray design may vary depending on availability.